The distribution and fate of14C-proline were investigated in immature tiger prawns,Penaeus esculentus Haswell, collected in Moreton Bay, Cleveland, Australia, by trawling during 1986/1987. Initially the prawns were fed14C-proline in food pellets to follow the pathway of proline absorption and distribution in the body.14C-proline was also injected directly into the prawn to provide sufficient tracer to follow the incorporation of14C into other amino acids and into proteins. A comparison was made of the metabolism of injected14C-proline over 48 h in prawns that had been fed and those that had been starved for 10 d. Free amino acids (FAA) in the muscle and protein-bound amino acids were analysed separately. Labelled proline was completely absorbed and distributed within the body 3 h after ingestion, about 80% being in the tissues, mostly in muscle. 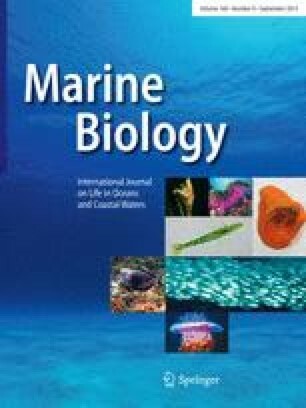 There was no significant difference between the total CO2 output in fed and starved prawns, but the latter metabolised about twice the amount of labelled proline over 48 h. At this time, in abdominal muscle of fed prawns, about 95% of the total muscle label was in the FAA; of the label in the FAA, 78% was proline and 18% glutamic acid, with the remainder in hydroxyproline, aspartic acid, glutamine, alanine and Kreb's cycle intermediates. In the starved prawns, proline was 58%, glutamic acid 24%, with correspondingly higher amounts in the other compounds. In the muscle protein, the distribution of label was similar in fed and starved prawns, with 72 to 74% as proline. The experiments showed that proline is not very labile in the tiger prawn and its rate of synthesis is slow. It does not appear to be an important source of energy as in some insects and cephalopods, but during starvation is only slowly oxidised for energy.